Mike Wilks is an award winning artist and the bestselling author of The Ultimate Alphabet and a string of other books. 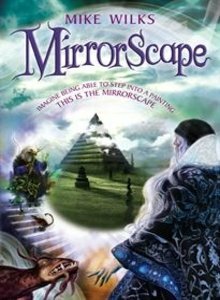 Mirrorscape is the backlist first book of an impressive trilogy which is artistic in every sense of the word. His intricate, detailed background information brings the reader directly into each scene. The storyline of this fantasy trilogy is unique and imaginative as are the characters which win the reader over from the first few words. Mel is an artistic thirteen year-old boy condemned by his poverty to obscurity. The village priest, Fa Theum, who has nurtured the boy’s talents, sends Mel’s drawings of imaginary beasts to a friend for his opinion. Dirk Tot, steward to Ambrosius Blenk the greatest artist in the Seven Kingdoms, so impressed with Mel’s work, arrives in person to offer the boy the rare honour of a free apprenticeship in Blenk’s studio. Mel’s father, who has other plans for his son, refuses his permission. Dirk Tot returns at a later time for an answer but encounters Fa Theum and Mel being severely beaten and secrets the boy away to the city of Vlam. Their attacker is the unrelenting Adolfus Spute, a man of pure evil, who controls the Fifth Mystery that includes Pleasures for anything that come under the category of the fifth sense, sight, and thus Mel’s paintings. Mel learns of the Five Mysteries that control each of the five senses. Originally formed to regulate and protect the villagers’ trade and produce from unscrupulous merchants, the meagre yearly tithes became extortion payments. Greed and power-lust created the invention of Pleasures, which demanded payment for purchase of the right to improve any existing trade or produce. Arriving in Vlam, Mel is given over to the head apprentice Groot, the depraved and sadistic nephew of Blenk who is ignorant of any misconduct. He is subjected to bullying, destruction of his property, and punishment for manoeuvred incidents and accidents. But Mel is observant, intelligent and a survivor. He makes friends with Ludo, another apprentice, and Wren, a kitchen maid whose father, a gifted clock maker, has been sent to work in the pigment mines because he couldn’t make a profit for the Pleasures from Time. These three lives are integrated. Mel learns about corruption and betrayal; about the power of knowledge, observation and silence. He discovers Blenk’s secret painting, a Mirrorscape that leads to other worlds and hybrid creatures which come alive on the other side of the painting. The abuse of this magical entrance leads to more corruption and chaos. It is through Mel’s incredible intelligence and talent that the trio’s lives are saved, only to be cast into new fantastic adventures. This trilogy written in incredibly creative and perfect prose, will suit readers of the 12 to 112 age group.